Next time you get busy baking in the kitchen and want to gift individual sized baked treats like chocolate truffles or macarons to your friends give this DIY treat box a try as making your own treat boxes using paper is much more affordable than store-bought options. Using any patterned or colored sheet of letter-sized card stock you can assemble a mini treat box that would be perfect to package sweets and could easily be used for wedding or baby shower favors. To get started all you need is a sheet of cardstock and some basic crafting supplies. Download the macaron box template and print the template onto a sheet of letter-sized card stock paper. If the card stock you are using has a different design or pattern on one side, make sure to load the paper so that the template will print on the back side of the card stock. 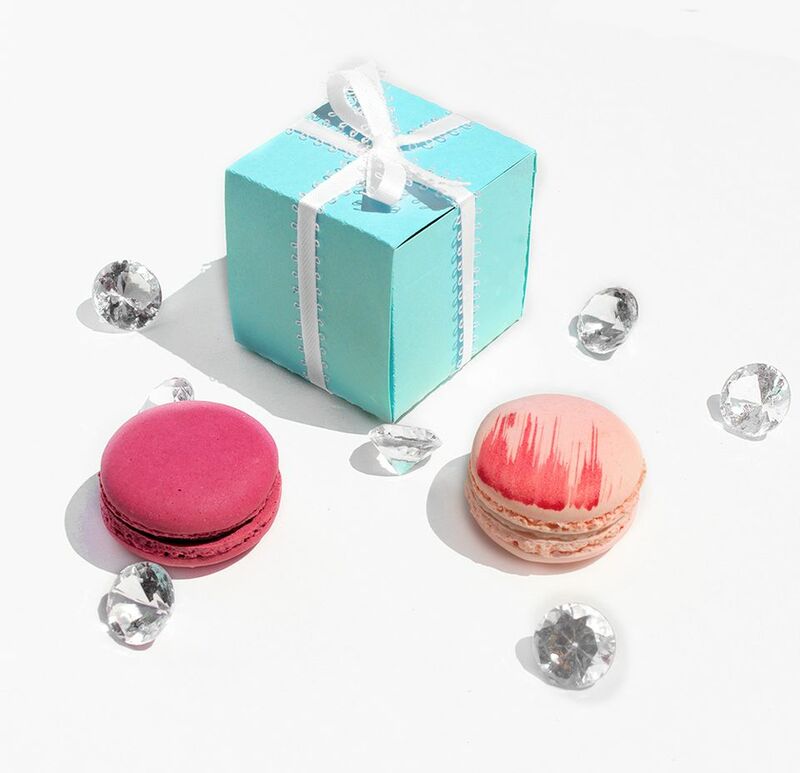 Using scissors or a craft knife cut out the exterior of the macaron box. To help you determine how to assemble the box using the template refer to this diagram. All the red lines should be cut with scissors or a craft knife, while all the blue dotted lines ​indicate you need to fold on the line. To get a nice sharp fold one easy way is to align a ruler on each of the dotted lines and fold against the ruler to get a straight fold. After folding remove the ruler and score the ruler against the edge to further press the fold down which will give you a nice sharp fold. Another way to get a crisp edge on your folded box is to use a bone folder, which you can learn about here. Once the glue has dried after a few seconds you are ready to place your macarons or other small treats inside the box. This template is designed to fit two macaroons or 2 to 3 small truffles. To close the box simply fold down the lid, if you wish you can put a small amount of craft glue on the final tab on the lid and then wrap a ribbon around the box to further hold the lid down and decorate the box to look like a small present. Feel free to experiment using a variety of cardstock colors and ribbons to festive treat boxes perfect for baby shower or wedding favors, or to package take-home treat boxes for Christmas and Thanksgiving. The options are endless on the variety of boxes you can create.